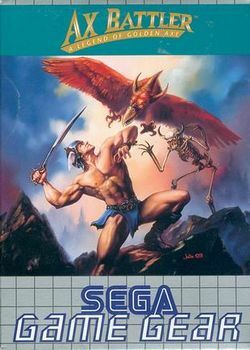 Ax Battler: A Legend of Golden Axe, released in 1991 for the Sega Game Gear, is the second non-standard game in the Golden Axe series (the first being Golden Axe Warrior, released earlier that year). Whereas Golden Axe Warrior was a clone of The Legend of Zelda, Ax Battler is inspired by Zelda II: The Adventure of Link. Unlike other games in the series Ax Battler starts with few attacks and must earn new ones by fighting at training dojos in each town. The currency of the game world is vials, which also double as a magic weapon. This page was last edited on 4 November 2008, at 00:49.